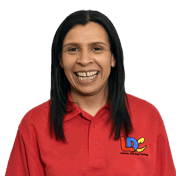 Hi, I'm Clare, I am a fully qualified Government Approved Driving Instructor (ADI) and I am passionate about road safety. I live in Derby with my husband and our two young daughters. Before becoming a Driving Instructor, I worked in the Social Care sector for 18 years. I spent several years supporting adults and young people with learning disabilities as well as assessing and training care workers from 16-60, on a one to one basis, who were working towards their NVQ Qualification. This is when I realised that teaching & training people is what I wanted to do.